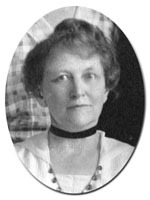 Annette Warner (1860 - 1948) was an artist, educator, and home economist. When she came to Cornell in 1913 as an assistant professor in home economics, she brought with her a formidable background in fine arts. She had studied at the State Normal School at St. Cloud, Minnesota from 1883 to 1884, Cowles School of Art in Boston from 1885 to 1889, Massachusetts Normal Art School from 1889 to 1890, Harvard University summer session in 1900 and 1903, Arthur Dow Summer School in 1904, New York School of Fine and Applied Art from 1912 to 1913, and Columbia University in 1921. She also studied fine arts in her travels to England, France, Italy and Greece. She worked with artists William M. Chase, Dr. Denman W. Ross, Robert Vonnoh, Emil Carlson, Tomaso Juglaris, and Charles Hubert Woodbury. Warner's twenty-three years of teaching experience before Cornell were also quite diverse. She served as the director of drawing and manual arts at the State Normal School at St. Cloud from 1890 to 1893, supervisor of drawing in the public schools in Pittsfield, MA from 1893 to 1897, director of arts at the State Normal School in Fitchberg, MA from 1897 to 1910, and principal at the John Herron Art School in Indianapolis from1910 to 1911. At Cornell her first courses included "Principles of Design" and "Environmental Art." In 1920, she became head of the Department of Household Art, a position which she held until her retirement in 1929. 2B Carl A. Kroch Library, Cornell University, Ithaca, NY, 14853. Phone Number: (607) 255-3530. Fax Number: (607) 255-9524.